Background: Paraoxonase is a calcium dependent enzyme which is bound to high density lipoprotein and acts primarily by inhibiting low density lipoprotein oxidation. Its activity is modulated by PON1 polymorphism. 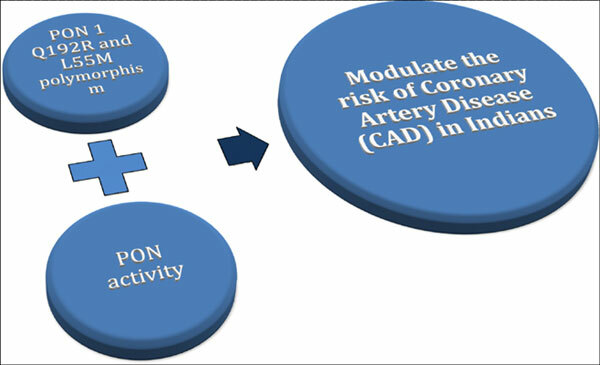 Objective: In the present case control study we determined the genotype frequencies of PON1 Q192R and L55M in Indian population and the association between PON activity and lipid markers in patients with coronary artery disease (CAD). Methods: 635 angiographically proven CAD patients from Cardiology & Medicine OPDs of our hospital and 635 age- matched controls were enrolled. Paraoxonase gene polymorphisms were analyzed by PCR-RFLP. Allele frequencies were compared in both patients and controls using Chi-square test. Serum PON1activity towards PON substrates, lipid profile and apolipoprotein A1 was analyzed. Results: Variant allele frequency of R & M in controls and patients was 28% & 37% and 20% & 21% respectively. Phenotypically, Paraoxonase activity was significantly lower in CAD patients as compared to controls, whereas, genotypically, PONase activity was low in all three genotypes in comparison to controls for PON1 polymorphisms. PON1 activity correlated positively with HDLCholesterol and Apo ‘a’ levels (r=0.38 and 0.38). PON1Q192R showed a significantly higher risk for CAD between patients and controls [OR =2.40; CI: 1.58-3.64] for the RR genotype. However, PON1L55M did not show any significant difference between patients and controls. Subgroup analysis showed a significant difference in PON activity and lipid markers between smokers and non-smokers, however, there was no difference among alcoholics & non-alcoholics. Conclusion: The study shows that the PON1-192R allele is strongly associated with CAD patients and affects serum PON1 activity toward paraoxon, implying a higher likelihood of development and/or progression of CAD among Indians. PON1 Q192R, PON1 L55M, PON activity, CAD, Lipid markers, Indians.